Not only does Keto Bomb taste amazing, but it helps fuel your ketogenic weight loss goals, by including MCT's (Medium Chain Triglycerides), as well as natural sources of essential fats. Keto Bomb also includes a high performance blend of electrolytes, which help maintain hydration and mineral levels, a challenge often associated with ketogenic or low-carb diets. Add just one scoop of this tasty, sugar free creamer to your favorite beverage to burn fat for fuel, boost energy and improve . 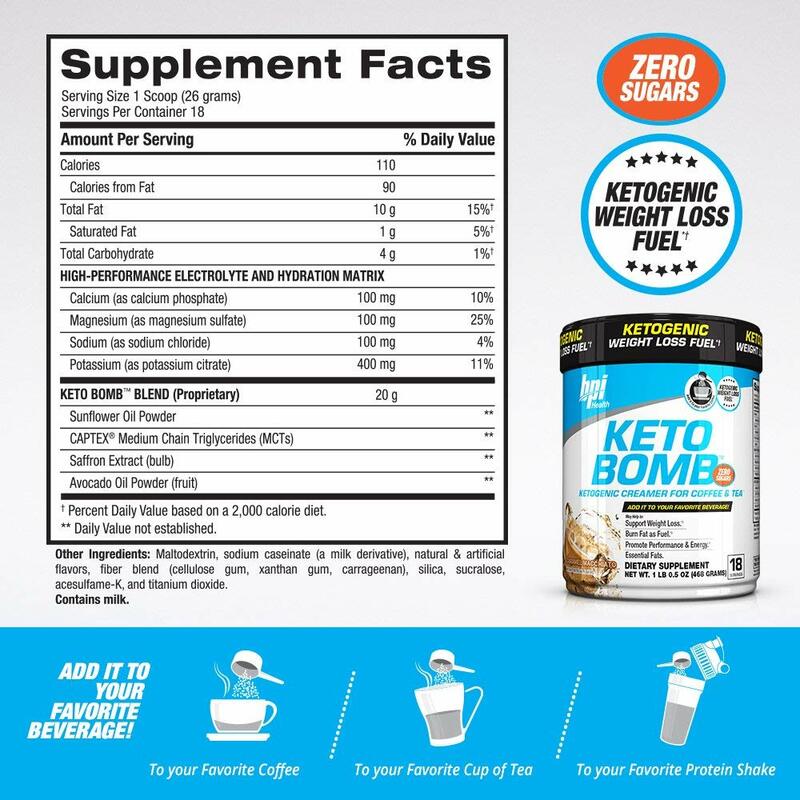 Keto Bomb is a ketogenic creamer for coffee and tea, but also can be added to other beverages. Keto Bomb utilizes a blend of electrolytes, medium chain triglycerides (MCTs) and other essential fats to fuel your body and brain for better athletic performance. 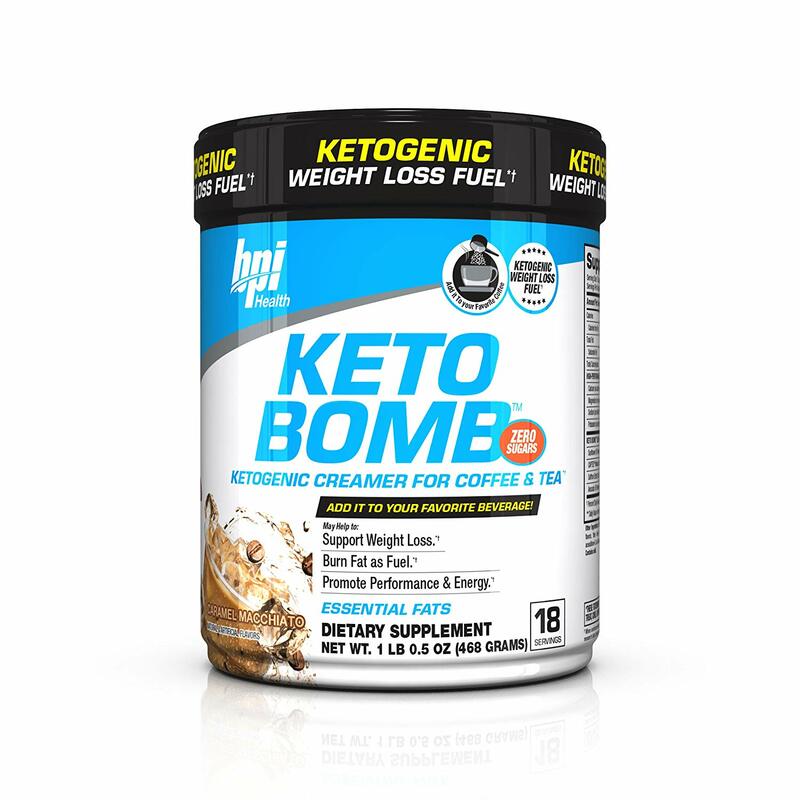 KETO BOMB is a delicious creamer made for those looking to lose weight and enhance performance. BPI Sports’ performance-boosting creamer is designed for those that are following a ketogenic or low-carb diet and are looking to accelerate the body’s fat burning capabilities. KETO BOMB utilizes a blend of electrolytes, medium chain triglycerides (MCTs) and other essential fats to fuel your body and brain for better athletic performance. With delicious flavors like French Vanilla Latte and Caramel Macchiato plus zero sugar, KETO BOMB helps boost energy and blast fat for a leaner, more shredded physique. Helps the body to maintain proper hydration levels. This is important while in the “adaptation phase” of a ketogenic or low-carb diet. Avocados are a natural source of important electrolytes which are important for healthy muscle function and fluid balance. Aids in supporting lean muscle building, preserving lean muscle mass, and reducing body fat. Maltodextrin, sodium caseinate (a milk derivative), natural & artificial flavors, fiber blend (cellulose gum, xanthan gum, carrageenan), silica, sucralose, acesulfame-K, and titanium dioxide.